Traditional dieting often works better on paper than it does in practice. 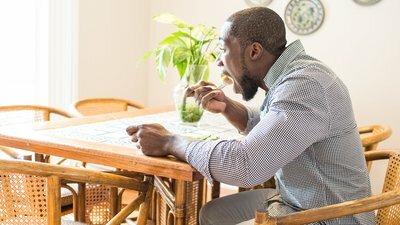 Lose more fat and experience less hunger with calorie cycling! With every passing year, research shows more definitively that the traditional approach to dieting simply doesn't work. On average, 1/3 of the weight lost following a standard diet protocol is regained within one year. And all of the weight lost—plus a little extra, in most cases—is regained within 3-5 years. While it may be tempting to say traditional dieting—restricting your caloric intake for a prolonged period of time—doesn't work because people "just don't stick with it," it's not that simple. Many people live in a caloric deficit—even a severe one—for months on end and don't lose fat. Just as our bodies adapt to a repeated stimulus in the weight room, we also adapt to the repeated stimulus in the kitchen—that is, dieting or bulking. Think about it: Performing 10 reps on the bench press at 200 pounds for 20 weeks isn't optimal, so why would dieting on the same amount of calories for 20 weeks be? Your body is designed to "survive and adapt," so when you start to reduce caloric intake, it will do everything possible to slow down the process of weight loss. Calorie cycling—or rotating between a deficit and maintenance level—is a growing area of research that shows the potential to provide sustainable fat-loss throughout the year. If you want to combat the problems that accompany traditional dieting, you must first understand what is causing them. Research has highlighted several negative changes that occur within your body when subjected to dieting for a prolonged period of time. Research has highlighted several negative changes that occur within your body when subjected to dieting for a prolonged period of time. After several weeks of dieting, these alterations create what is known as "adaptive thermogenesis" (AT). I talked about the hormonal side of this condition in my article "Are Hunger Hormones Sabotaging Your Fat Loss?" but here's the short version: When you provide your body with fewer calories, it adapts by slowing your metabolism down to make sure it can still maintain proper functioning, while also battling to stay near its natural "set point". Put another way, the fewer calories you take in, the fewer you'll eventually burn. A study published in the International Journal of Preventive Medicine compared an approach using an 11-day deficit, followed by a 3-day deficit, followed by 3 days with a typical linear calorie deficit. This four-week study was followed by a two-week period in which subjects ate maintenance calories so that researchers could observe how people "rebounded" after the dieting period. While both dieting groups lost weight, the calorie-cycling group lost an average of 3 pounds more. The also regained almost 2 pounds less during the calorie-maintenance phase. While these differences may not seem very significant, keep in mind that this took place over just four weeks. In theory, if these results were extrapolated to reflect a normal dieting or contest-prep phase of 12-20 weeks, they could lead to a 13-pound weight loss and 6.6-pound weight regain difference. One possible explanation for the difference in weight loss has to do with the changes in subjects' resting metabolic rate (RMR), a key factor in long-term weight maintenance. The traditional dieting group had a greater decline in RMR, meaning they burned about 40 fewer calories each day over the four weeks. If you were to extend the length of the diet for three or four months, it's not hard to imagine there being a difference of well over 100 calories between the two groups. Over a prolonged period of time, that calorie surplus can contribute to obesity. Deficit Vs. Maintenance: How Long? Calorie cycling may be an excellent approach for anyone who competes or goes through months-long "cutting" and "bulking" periods. Research has shown that some of the negative adaptations from traditional dieting take years to recover from, or may even be effectively permanent. This means your 12-week prep can result in years of struggling with a slower metabolism and hunger. Based on what research is available, it seems that a 2-4 week calorie deficit is long enough to start the cascade of events leading to AT. [4,6] Therefore, if you want to cycle calories and limit the adaptions from a deficit, aim to keep the time period during which you reduce calories to four weeks or fewer. It also seems that the amount of time you spend in a deficit best dictates the time you should spend at or near maintenance during your calorie cycling. [4,5] The longer your deficit, the longer your maintenance phase should be, and vice versa. There is no one-size-fits-all number or schedule I can give you here. What works for you may not work for me or your friends. Factors such as age, body-fat level, metabolic health, and deficit severity may impact adherence and outcome. Here are some example cycles I've found success with. Keep in mind that what works for one person, may not work for another, so I recommend you experiment and tailor your approach based on your own preferences. Keep in mind that what works for one person, may not work for another, so i recommend you experiment and tailor your approach based on your own preferences. Here are a few tips to keep in mind as you determine how to best add calorie cycling into your fat-loss approach. This is not a way to live for years on end; this is a healthy way to cut weight for a period of weeks or a few months, either to meet a goal or for contest prep. Don't subject yourself to a caloric deficit for longer than that, or you're asking for trouble. Stick to eating maintenance calories when you're not in a caloric deficit; this isn't an excuse to spend a weekend indulging in endless buffets or eating contests. The severity of the deficit period should not be too extreme; somewhere between 300 and 700 calories below maintenance is sufficient. You may be able to shave an extra 100-200 calories due to the shorter duration of the deficit, but don't push it. Schedule training for your weak muscle groups on a higher-calorie day to provide the fuel you need to see progress in strength and size. There's no need to change up food sources on your higher days. Keep it simple—stick with the foods that work for you, but up the ante on portions. You're only eating 300-700 more calories, so keeping a sensible macro intake built around high-protein and nutrient-dense foods is your best approach, rather than using this system as an excuse to eat pizza all day. This isn't to say you can't use this time and the extra calories for a few foods you enjoy; just keep it within reason. Calorie cycling is all about building a healthier approach for the long term, not leaping back and forth between deprivation and excess. That's the old way, and it's time to put it to rest once and for all! Anderson, J. W., Konz, E. C., Frederich, R. C., & Wood, C. L. (2001). Long-term weight-loss maintenance: a meta-analysis of US studies. The American Journal of Clinical Nutrition, 74(5), 579-584. MacLean, P. S., Bergouignan, A., Cornier, M. A., & Jackman, M. R. (2011). Biology's response to dieting: the impetus for weight regain. American Journal of Physiology-Regulatory, Integrative and Comparative Physiology, 301(3), R581-R600. Müller, M. J., Enderle, J., Pourhassan, M., Braun, W., Eggeling, B., Lagerpusch, M., ... & Bosy-Westphal, A. (2015). Metabolic adaptation to caloric restriction and subsequent refeeding: the Minnesota Starvation Experiment revisited. The American Journal of Clinical Nutrition, 102(4), 807-819. Davoodi, S. H., Ajami, M., Ayatollahi, S. A., Dowlatshahi, K., Javedan, G., & Pazoki-Toroudi, H. R. (2014). Calorie Shifting Diet Versus Calorie Restriction Diet: A Comparative Clinical Trial Study. International Journal of Preventive Medicine, 5(4), 447. Friedl, K. E., Moore, R. J., Hoyt, R. W., Marchitelli, L. J., Martinez-Lopez, L. E., & Askew, E. W. (2000). Endocrine markers of semistarvation in healthy lean men in a multistressor environment. Journal of Applied Physiology, 88(5), 1820-1830. Wing, R. R., & Hill, J. O. (2001). Successful weight loss maintenance. Annual Review of Nutrition, 21(1), 323-341. Erdman Jr, J. W., MacDonald, I. A., & Zeisel, S. H. (Eds.). (2012). Present Knowledge in Nutrition. John Wiley & Sons. Knuth, N. D., Johannsen, D. L., Tamboli, R. A., Marks? Shulman, P. A., Huizenga, R., Chen, K. Y., ... & Hall, K. D. (2014). Metabolic adaptation following massive weight loss is related to the degree of energy imbalance and changes in circulating leptin. Obesity, 22(12), 2563-2569. Rudy Mawer is a CISSN and certified personal trainer who currently works as a research assistant at the University of Tampa.